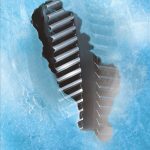 Advanced carbide insert technology meshes with increased demand for large gears. 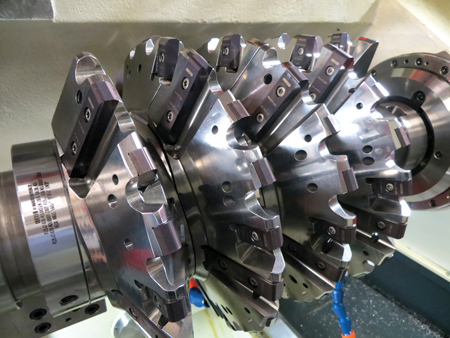 Indexable carbide inserted tooling continues to push large gear productivity. 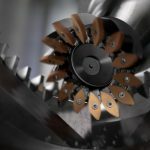 As manufacturers of big gears are further pressured by increased production demands from key industries, including energy, they strive to meet such requirements through faster machining speeds and feeds, yet still maintain high levels of quality. 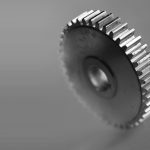 In most instances, indexable carbide inserted tooling gives gear shops longer tool life—often four hours or longer as compared to the one or two with solid tooling—and increased cutting speeds for more aggressive machining to reduce cycle times. 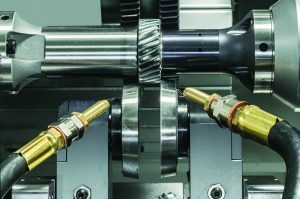 Indexable carbide insert tools also provide multiple cutting edges, which, depending on the gear teeth profile, allows a shop to flip cutting edges from one side to the other, thus increasing tool efficiency. 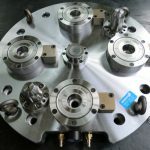 On the cost savings side, the tooling requires an initial investment of cutter bodies, which, in some cases one cutter body can be used in multiple applications by simply changing out the inserts, depending on what type of job is required. These inserts can also be rotated so that multiple cutting edges are utilized. 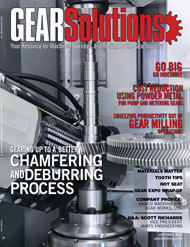 Another opportunity for cost savings is that large gear manufacturers can opt out of using solid carbide tooling, which can be prohibitively expensive or even impossible to construct for certain large gear applications, yet still reap the benefits of increased productivity from carbide with the more cost-effective indexable inserts. 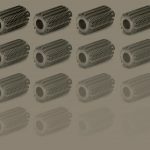 When compared to solid high-speed steel (HSS) or cobalt gear tooling, indexable carbide inserted tools not only allow for much higher cutting speeds, but also help reduce the amount of required tooling, again saving cost. For example, a user is able to run a solid HSS tool at perhaps 70 to 100 surface feet, depending on material. As the tool wears, cutting accuracy diminishes, and the tool must be re-ground and re-coated. This fact alone often means that shops will likely have three or more of the same solid tools available for a job—one tool in service, one on the shelf ready to go and one or more out being re-ground and re-coated. For some shops, it is common to inventory up to 10 of the same tools just to ensure that production keeps running. 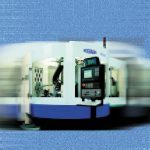 Additionally, large gear tooling, for the most part, requires made-to-order specials, and carbide insert technology is especially advantageous in that it affords a nearly infinite level of customization possibilities. 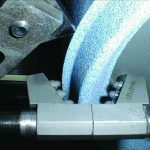 With an indexable inserted gasher, for example, cutters can be produced for roughing, semi-finishing or finishing. 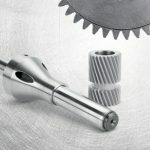 The inserts can be customized to the exact gear tooth geometry or for simple roughing. And by starting fresh each time, rather than wearing down and then having to regrind the cutting surface, the inserted gasher offers precise repeatability and accuracy. 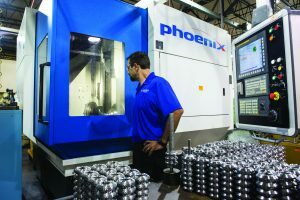 A major new development in this area is twin-start indexable carbide insert gear hobs, tools that take advantage of the increased power and speed of modern CNC gear-cutting machines to achieve increased productivity. This new solution, with two half helixes on the same gear hob module, allows for running at feedrates that are twice as fast as those of a single helix design. 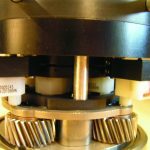 Shops can thus reduce gear manufacturing cycle times by half while still maintaining the highest possible quality levels. 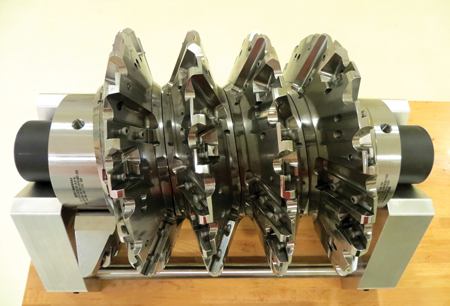 In customer application testing, Seco Tools successfully slashed the production cycle time of a large seven-foot, module 12 gear ring from 22 hours down to only three hours with Seco’s latest twin-start indexable carbide insert gear hob. This equated to a more than 85 percent reduction in time over the previously used HSS hobs. 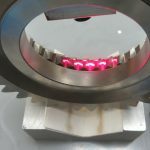 As a result of its research and development, Seco has achieved what it believes is the perfect insert balance using its Duratomic coating process. 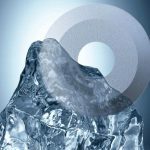 Inserts with a tailored substrate and Duratomic coating provide an effective combination of toughness to prevent thermal cracking and high wear resistance for long tool life—together with high-speed capabilities. 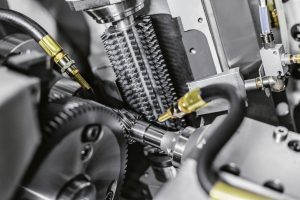 Gear makers should note that no matter how advanced the indexable carbide insert technology, machine tool capability, in some instances, can prevent optimum tool performance and thus limit machine capacity as well. Machines must have high power and rigidity to run twin-start indexable hobs, for example. Unfortunately, there exists a great deal of older equipment in the marketplace today that has been around since World War II. 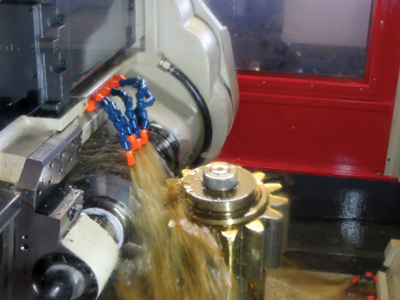 Shops with such machines are often restricted to using only HSS or powdered metal cutting tools. While some will also use solid carbide hobs, this is much less common due to the high cost of that tooling. 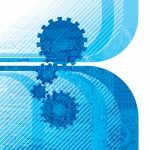 Indexable tooling can be applied in these instances, but some care must be taken when selecting tools. The global push for clean energy in the form of wind turbines will continue to drive demand for large gears. 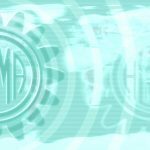 There are also many other industries driving that demand such as mining and construction, oil and gas and marine, to name a few. 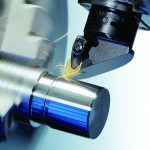 Indexable carbide tools are an excellent, cost-effective fit for this growth, offering increased machining speed and productivity never before achieved in large gear cutting. 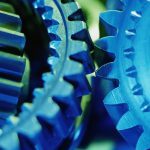 This surge in demand, and the resulting push in research and development of these high-end tools, suggests they are poised for a sustained resurgence in the marketplace. Todd Miller is the manager of rotating products for NAFTA at Seco Tools, responsible for solutions and applications involving face, square shoulder and disc milling. Todd and his team of product experts are dedicated to providing a consistent, high-level of support to Seco customers throughout the United States, Canada and Mexico. For more information, visit www.secotools.com.